Heavy Duty Material Trailer!! 30"x60" deck dimensions with Heavy duty 2" channel frame. It comes with 18x8.50 Tires. Self adjusting drop brake with "T" handle for easy pulling. Stake pockets for channel riser and corner pin pockets for rolled goods. Pins included with attaching chains. Roller bearings in wheels for smooth rolling. Open back frame for hoisting fork or forklift access. 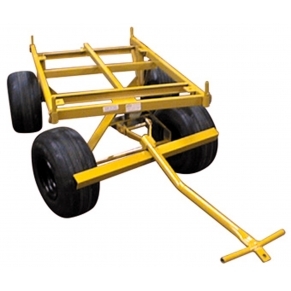 Rear hitch and front pin hitch for the ability to form train of trailers. Pins included. 2000 lbs capacity. Also available with Optional NonFlatLite (NFL) 18 x 8.50 wheels.